CenTiRe has developed a company page on the online networking site LinkedIn. Basic information about the Center can be found on the page, with a link to the CenTiRe website to obtain more information. The NSF I/UCRC program awards grants for administrative operation in 5 year phases. While NSF funding does not go toward projects, the grant serves a valuable role in helping the Center fund its current operations and expansion. CenTiRe was the lead recipient of a multi-I/UCRC NSF grant to investigate the integration of sensors into tires. Researchers at three I/UCRC’s at Virginia Tech, one I/UCRC at Penn State University, and 12 industry partners are collaborating on the $1.2 million National Science Foundation-funded project. Dr. Saied Taheri, CenTiRe Director, is the lead investigator. Excellent interview with P.K. 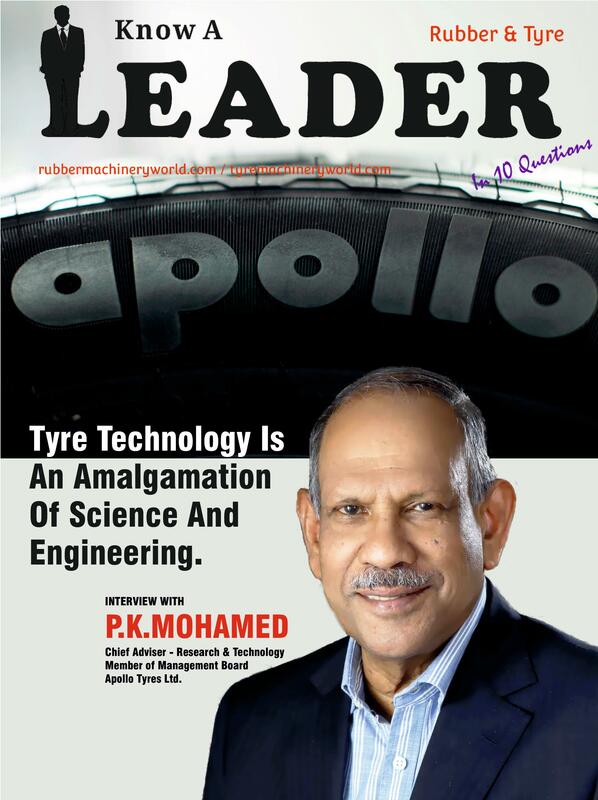 Mohamed in the Rubber & Tyre Magazine, "Trye Technology is An Amalgamation of Science And Engineering." P.K. Mohamed works for Apollo Tyre who is a member of CenTiRe. He serves on the CenTiRe Industrial Advisory Board. All projects performed at CenTiRe are selected, mentored, and reviewed by our industry members. Projects can span 1-3 years, and so we have projects completing while others are continuing or just starting. Earlier this spring we welcomed Maxxis Tire as a member of CenTiRe. They have already become an active participant in the Center by taking part in the new project proposal assessment process and attending the Spring IAB meeting. We look forward to many years of interaction and involvement. Our next IAB meeting will be held October 6-7 in Akron, Ohio at the Fairlawn Hilton. The meeting is the Thursday and Friday the week before the ACS Rubber Division Conference and Expo to make it easier for our international members to arrange their travel schedules. Mark your calendars. Details of the meeting will be issued later. The National Science Foundation provided an REU (research experience for undergraduates) supplement to the Materials 2E project (Surface Engineering Approach for Enhanced Filler Dispersion and Hysteresis Reduction in Rubber Compounds) to sponsor Annette Valceschini, a senior student majoring in Chemistry at California State University - Chico. On August 26, Nicole Swanson successfully defended her PhD thesis: Polybutadiene Graft Copolymers as Coupling Agents in Rubber Compounding. Nicole was part of a team led by Professors Coleen Pugh and Sadhan Jana, and at separate times, his students Kushal Bahl, Prasad Raut and Hamad Albehaijan. Nicole provided the synthetic expertise for developing coupling agents based on polybutadiene grafted with polypentafluorostyrene, which provides perfluoroarene groups to interact with electron-rich aromatic rings on carbon black and lignin, and copolymer grafts of pentafluorostyrene and trialkoxysilane-functionalized styrenes, which can react with silica fillers.